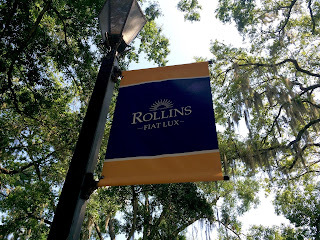 At the end of June I visited Rollins College during a trip to central Florida. I had been peripherally aware of Rollins for years, but only in the sense that I knew it was well regarded for the beauty of its campus and that it often appeared on “best of the South” ratings lists. Having moved to Virginia a year ago, I am committed to visiting more Southern colleges and universities, and my wife’s trip to the American Library Association annual meeting in Orlando seemed like a good opportunity to get some visits in. Despite 96º temperatures and unbelievable humidity, the tour was excellent and I came away with a strong sense that Rollins knows what kind of school they want to be and that they are justifiably proud of their institution. 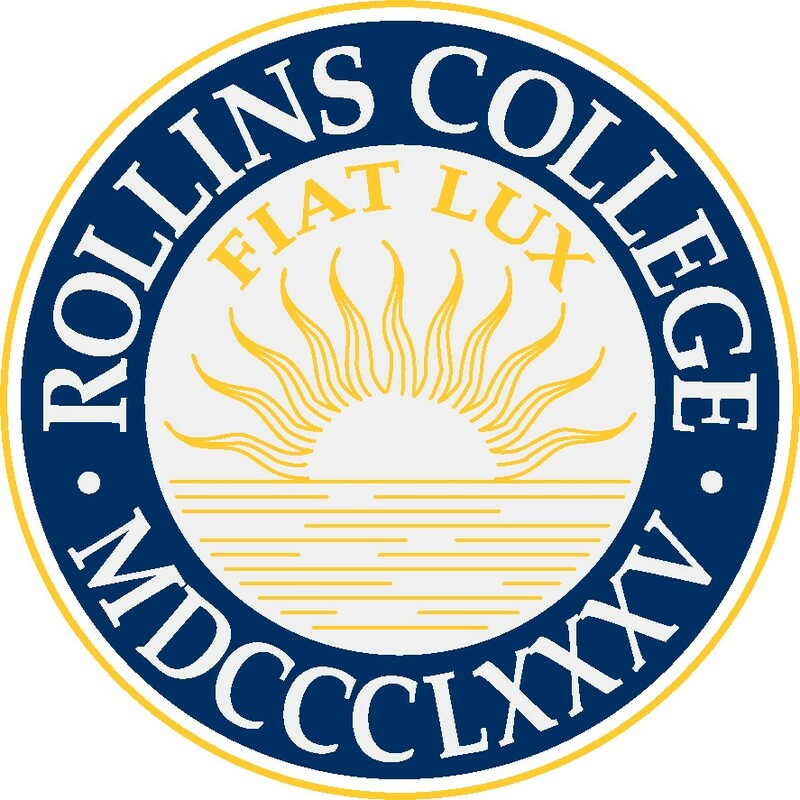 Having seen the college first-hand, I would definitely recommend Rollins to any student looking for a small liberal arts college with excellent academic and athletic opportunities in the South. I would also consider suggesting it to a student who wasn’t necessarily considering a southern campus, because while central Florida has the weather of the South, it feels much more cosmopolitan. A little over 1,900 undergraduates (approximately 59% men/ 41% women). Students come from 50 states and 50 countries. Rollins accepted about 47% of their 5400 applicants to fill a first year class of 550. 36 majors and 64 areas of study for undergraduates; 10 different graduate programs. Bachelor and Master degrees awarded. They also have a 3:2 accelerated B.A./M.B.A program. NCAA Division II (with one exception); 23 varsity teams (12 women’s, 11 men’s); numerous intramural sports.The women’s golf team won the NCAA National Champion in 2016. Waterskiing is the sole Division I sport on campus. Over 100 clubs and organizations on campus. 6 fraternities (four with housing) and 7 sororities (six with housing); about 45% of the campus participates in Greek life. On campus housing is required for all first and second year students (unless their family lives nearby); housing is only guaranteed for two years. Downtown Winter Park, a cute little town with a good mix of shops and restaurants, is a short walk away. Tuition, room & board and fees total just about $57,000. Parents need to fill out the FAFSA (Free Application for Federal Student Aid) and the average need-based aid package for first-year students is between $28,000-$38,000 before merit aid. 85% of students receive merit assistance. While the tuition is the same for students whether or not they hail from the Sunshine State, Florida residents can use a $3,000 annual “Florida Residents Access Grant” to defray costs. Rollins has Early Decision I and II as well as Regular Decision options. ED I has a deadline of November 1, with ED II’s deadline being December 15. The RD deadline is February 1. Note that the priority date for students seeking merit aid is November 1. Students use the Common App. Test optional, or Rollins will accept the SAT or ACT. Mid 50% of the old SAT was 1120-1290 (CR+M) and 24-29 for the ACT. Rollins will encourage applicants with lower test scores but good high school grades to resubmit their applications as test optional. 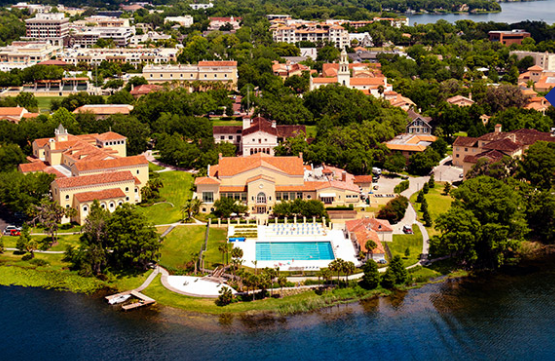 Rollins College is located in Winter Park, Florida, which is about 10 miles north of Orlando. Winter Park is a small city (c. 27,000) in the central part of the state. Winter Park boasts beautiful weather, a thriving shopping, dining and arts culture and proximity to Orlando, which is one of America’s top 25 most populous cities. 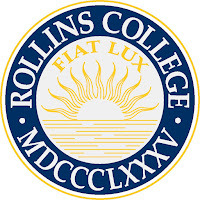 Rollins College was founded in 1885 by Lucy Cross with an eye towards giving the South a New England style liberal arts college. The school is now non-denominational, but the campus chapel is still a destination wedding location for Rollins grads. The campus is on 70 acres of land along a lake, and is very pedestrian friendly. At just under 2,000 students, Rollins is a small liberal arts college that has some very unique approaches to undergraduate education. First semester students choose from one of several “Rollins Conference Courses“–a seminar whose professor serves as their academic advisor, and whose classmates comprise their orientation group. The list of options available show the breadth of interests of Rollins professors and make it unlikely that a student wouldn’t find something of interest. Incoming students list their top eight choices and 90% of students gain admission to one of their top three choices. In addition to the professor, the class also has two Peer Mentors (upperclass students) who serve to help first year students adjust to life at Rollins. and so on. Students are expected to come to see connections between the different subjects they are studying, and it is easy to see how this program can facilitate that. under the hot Florida sun! The most popular major at Rollins is business, followed by biology, marine biology, studio art, communications, education and music. Every class at Rollins is deliberately small (all classes are capped at 25, and the average is 17) and heavily features student discussion. Nearly every classroom has either a large round table or desks in a semi-circle; professors want students to be able to make eye contact with each other. There is an enviable 10:1 ratio of students to professors, 99% of whom have a terminal degree. Professors are always available and encourage students to do research with them. My tour guide, who will begin her fourth year in the fall of 2016 told us that she co-published an article about a Robert Browning poem with one of her English professors following her first year of college. Very impressive! Rollins has 23 varsity sports teams all of which are NCAA Division II, except for waterskiing, which is Division I. Athletic scholarships are available for Division II sports, and they can be a great opportunity for talented athletes who can’t find a Division I program, or who would prefer less travel. Rollins teams compete in the Sunshine State conference against other Florida colleges and universities. The campus boasts multiple tennis courts, an all-purpose soccer/lacrosse field (being renovated with new turf surface when I visited), multiple pools, and Lake Virginia, which hosts the crew, sailing and waterskiing teams. Baseball and softball play down the road, as do the golf teams; the women’s golfers just took home their 13th national title. First year students at Rollins stay in one of four freshman dorms; after that they can live in a variety of upperclass housing options, including fraternity and sorority dorms. Third and fourth year students can opt to live off-campus if they wish. The dormitory that we were shown on our tour was nice as these things go; we saw a sample furnished double which was a pretty tight space, though we were told that it was the smallest room in the building. Among the plusses of the dorms are 200 cable TV channels, abundant WIFI and free laundry machines. 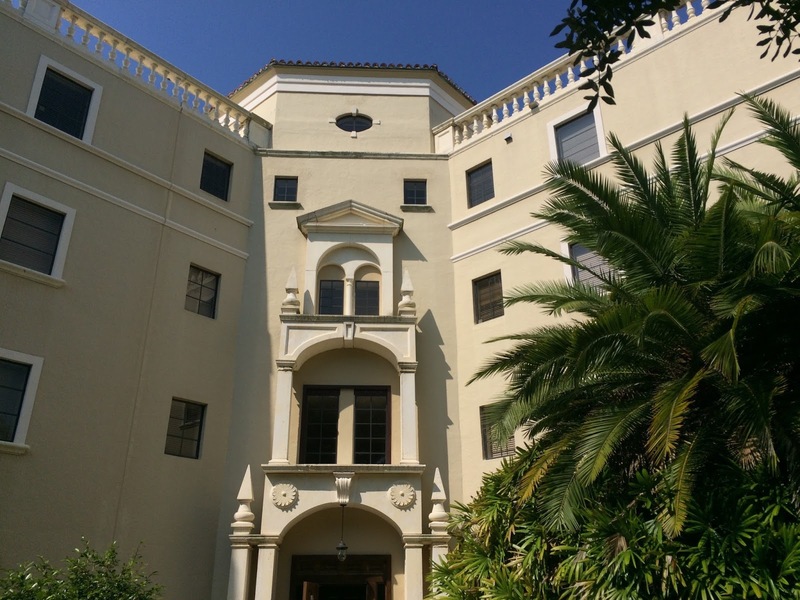 Unlike some schools that tightly police entry to dorms, there are no sign-in desks at Rollins, but every door (including student rooms) locks automatically, and no one can gain admittance to a dorm building not theirs unless accompanied by a resident. Rollins has rules providing for quiet hours in the dorms from 11pm-8am on weekdays, 1am-9am on weekends and 24 hours during exams; they also have “courtesy hours” around the clock year round where anyone can be asked to quiet down by a neighbor. This sounds good, and according to our tour guide, it works well in practice. The dining options are varied: students who are on the meal plan can buy food at one of four campus locations (including “Dave’s Boathouse”, a new pub by the pool that stays open until 2am) or they can use their meal plan money to get food from local pizza shops, smoothie stores and even the Cheesecake Factory! Perhaps it is this variety that accounts for Rollins’ outstanding reputation for good food. Last year they were #26 nationally, and are perennially in the top 30 of campus dining. Rollins’ library was a nice, welcoming space. It’s four floors have books on the top two floors, a main floor (and cafe space) open around the clock, and multiple computer labs. 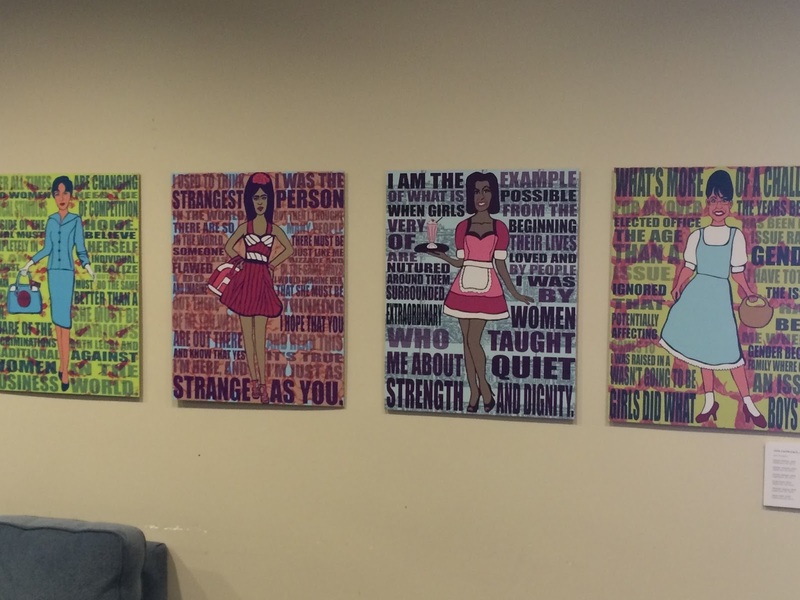 I really enjoyed some of the art on display in the library, including some very interesting prints by Julia Lanfersieck, an alumna of Rollins that juxtaposes quotes by prominent women with fanciful images of them in different roles. Prominently featured in the library and in the academic buildings was Rollins’ honor code. Rollins’ honor board is run by students (with faculty support) and students affirm that they have neither given, nor received, nor witnessed any unauthorized aid on academic assignments. According to my tour guide, the students take this quite seriously and are proud of it. Compared to, say, the University of Virginia’s honor code, this one seems a little less rigorously enforced, but it also seems more focused on providing teachable moments than on being a punitive body. That said, having worked at schools that required students to agree to similar honor codes, I think it is a valuable thing to make students affirm that their work is entirely their own. Students applying to Rollins can use either the Common Application or Rollins College’s own application. There is a $50 application fee, and students can opt to apply without sending ACT or SAT scores, though merit aid is much more likely to come to students who submit standardized test scores. Speaking of merit aid, the college awards a lot: 85% of students receive some kind of merit assistance. But if students want to be considered for this money, they need to be on their toes. The “priority” deadline for consideration for merit (non need-based) aid is the same as the Early Decision I deadline: November 1.
individualized: regional admissions officers take great interest in their applicants and try to get to know the students very well during the process. Obviously this takes time, so students who want to go to Rollins and who are seeking merit aid should definitely start with an admissions tour before or during their junior year so that they are ready to submit a competitive application very early in their senior year. I really enjoyed my tour experience at Rollins, I made my reservation by phone and was warmly welcomed when I arrived at the office. The admissions office had multiple TV displays welcoming the students their for the days’ tour (“Rollins welcomes Jenna from Marquette High School in Chesterfield, Missouri”, for example) which delighted the parents and embarrassed the kids. My 10AM Monday tour had students from Florida, Texas, Missouri, New York, Massachusetts, Georgia and Minnesota. My tour guide was candid, thorough and funny. She was not shy about expressing her opinions (such as the feeling that Rollins’ men’s sports teams lose more than the women’s teams) and her love for Rollins was clear. After the hour and ten minute long tour we had an info session that attempted to model Rollins’ discussion based classroom model. Instead of watching a video we were encouraged to ask questions of the admission counselor who gave detailed, complete answers. • the Common App or Rollins app. • the transcript–Rollins recalculates GPA to an unweighted 4.0 scale, so students should know that letter grades are important no matter how “advanced” a class might be. • that said, students will receive college credit for a 4 or 5 on an AP exam, a C+ or higher in a dual enrollment college class, and can transfer up to a year of IB credit. • extra-curricular activities. 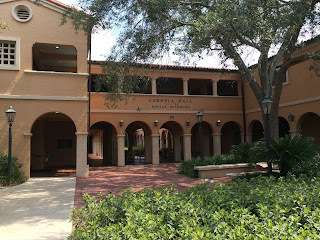 Rollins encourages students to submit a resume if their activities do not fit in the space provided by the Common App. • recommendation letters; 1 counselor statement is required, and up to 2 supplemental letters from teachers or coaches are allowed. This is all pretty typical, but at multiple times in my couple of hours at Rollins I was told how much the admissions office wants to get to know students. 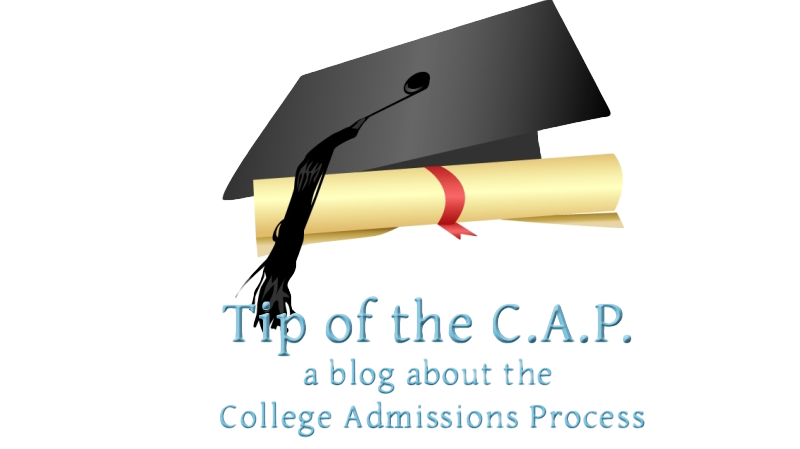 Besides a strong personal statement, I really got the feeling that students should cultivate a relationship with their regional admissions representative–kids should not hesitate to call the office to ask questions, and if at all possible, a visit to campus should probably be arranged. 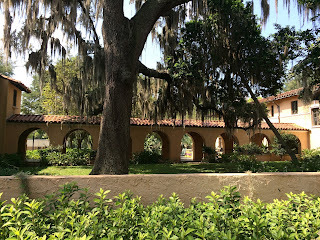 Rollins College boasts a beautiful campus, a great location in central Florida, and very innovative approaches to liberal arts education. It combines the virtues of a small college with big college opportunities for research and faculty collaboration; small town location with proximity to a big city; and excellent weather. While it was very hot when I was there in the last week of June, average temperatures October through March are in the 70s and very comfortable. I wouldn’t hesitate to recommend Rollins to students looking for southern liberal arts colleges, but would also suggest it to more open minded students who are not explicitly searching for schools south of the Mason-Dixon line. 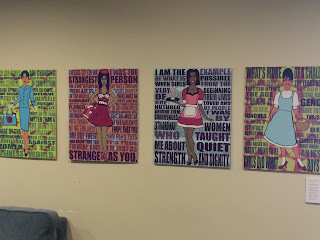 Fabulous recap of the Rollins environment and learning culture. Thank you! Thanks Robin! I hope your students and many others will find this to be helpful when they make their college decisions.